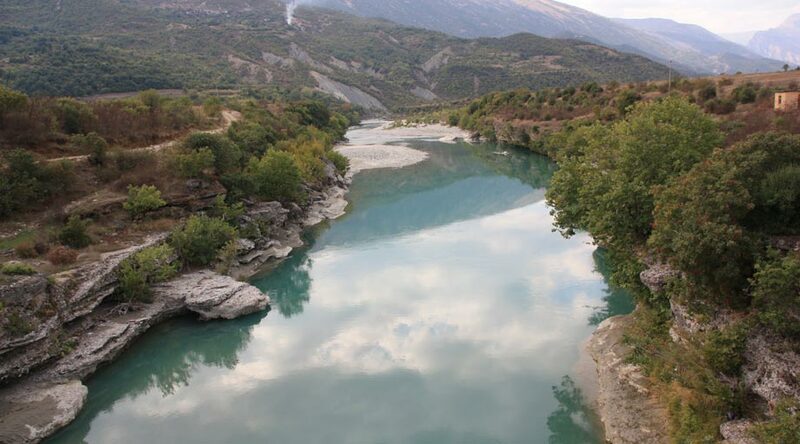 The Upper Vjosa Valley is very rich with water sources, where apart from the main Vjosa River, which runs continuously during the entire year other tributary rivers permeate the territory, such as the Rivers of Sarandapor, Çarshovë, Lengarica, Lemnica and Dëshnica. Also a number of dynamics perennial and seasonal streams fed the Vjosa River flowing from both right and left sides of the valley. The information regarding the historical use and exploitation of hydro sources of the Valley, are as yet meager and fragmentary. This is mainly due to the lack of previous researches on this field of study, but also as a result of the intensive intervention and changes happening in the hydro-system of the territory during the communist regime. Over this period a large number of water structures were established, including the construction of irrigation and drainage channels, reservoirs, pumping stations, and etc, which had a large impact on the coverage or destructions of some of the old water traditions systems utilized in the Upper Vjosa Valley. However, during a field research undertaken in the valley in 2011, there were identified and recorded a number of hydro-structures, which is quite likely to have been in use at least since the Late Medieval period. As such is the water channel of Kosina, which runs on the left side of the River flow in about 3.4 km of length, channeling the water from the source of Mokrica to the modern village of Kosina. Its earlier use might have been perhaps related with the irrigation of the land properties of the 13th Century Monastery of St. Mary, at Kosina. During the Late Medieval period it was also used to bring water in the old water mill of the village. In the communist era the channel was rebuild and reconfigured to irrigate the common lands of the village. A number of private owned cisterns, “topila”, of the same construction typology, have also been recorded in the valley, some of which seem to have been in use from the 18th -19th centuries, and are still utilized to irrigate the family homesteads of the village. Ever since the early 90’s of the last century the irrigation and drainage systems of the area have been seriously damaged, and a part of it appears to be today non-functional and out of order. On the other hand, these later years the river water sources are utilized for the construction of hydro-powers. Such a project is currently running in the Valley of Lengarica River, and if this policy is further expanded, then the impacts will be negative, not only in the loss of the historical tradition ways of water use, but it will also seriously affect the ecosystem and biodiversity of the area.